Shortened from the Hawaiian word for quickly (wikiwiki), wiki has also been described by the "backronym" What I Know Is. Wiki software provides a framework for organizing a freely expandable collection of hyperlinked pages. Documents are authored collectively using a simple markup scheme. The resulting collaborative hypertext document, called a wiki, is produced by a community of users. The original WikiWikiWeb was established in 1995 by Ward Cunningham, who invented and named the Wiki concept and produced the first implementation of a WikiWiki server. RikiTikiWiki© is based on Notebook, a desktop wiki written by Will Duquette. One problem with the tools traditionally used to distribute information is their volatility. A note written on a white board is here today and erased tomorrow. Sticky notes become unstuck and swept into the trash. Memos and e-mails are read, discarded, and often forgotten. A wiki is a simple, yet powerful, tool for distribution of information which also provides a readily available and retrievable knowledge base. Automatically indexes new pages, permitting a powerful global search function. Tracks page edits (who and when), and provides the ability to roll back changes. Uses Creole wiki markup. 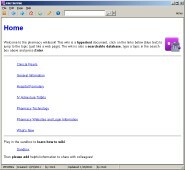 Creole is derived from extensive research into the ease-of-use and functionality of wiki markup. "What's New" automatic log page. Fixed: load local html file into browser, not wiki. Improved: web page and document linking. Fixed: 'file not found' error. Added: exact phrase search function: "enclose it in quotes". RikiTikiWiki© is free for educational, non-commercial use. Install the program into a shared folder on the network. Give all staff full read/write privileges to the shared folder. Encourage all staff to embrace "the wiki way".